"Why, you don't know, I s'pose, that Lizy's cut stick [emphasis added], and clared out, with her young un?" I have my suspicions of etymology, the most defensible being that "to cut stick" has to do with making some piece of a runaway's paraphernalia, such as a bindle or walking staff. But I have been unable to find any sources to corroborate or contradict this possibility. Do any formal sources shed light on how to cut stick is related to running away secretly and quickly? A remote area; backwoods: moved to the sticks. A city or town regarded as dull or unsophisticated. But stick can mean "a threatened penalty" by definition 12. It may be that the phrase to cut stick implies running away from a punishment, hence the haste and secrecy. But this seems like a reach because none of the definitions I found of to cut stick explicitly mention punishment. 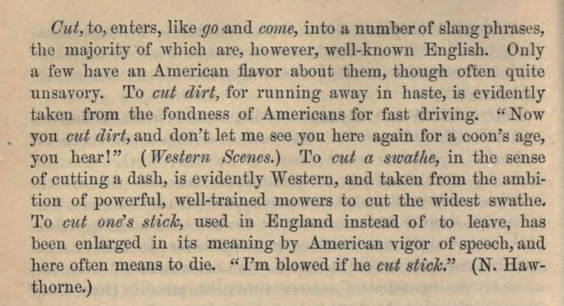 The American cut your stick, to die, comes from the British cut your stick, to depart, which dates back to at least 1813. Uncle Tom's Cabin by American author Harriet Beecher Stowe was published in 1852 so let's check an almost contemporary dictionary. The OED has the British English sense of departing from 1825 but with no etymology. "Pilgrims on leaving the Holy Land used to cut a palm-stick, to prove tey had really been to the Holy Sepulchre. So brother Francis would say to brother Paul, ' Where is brother Benedict ?' 'Oh (says Paul), he has cut his stick ! ' — i.e. he is on his way home." CUT ONE'S STICK. To be off. Cant. Given the subtitle of the book -- "with Burlesque Notes in the Manner of the Most Celebrated Commentators" -- I don't think we can trust these notes to be real, and therefore the 1597 to be fictional, but they are at least 1813 examples. I found a citation for De Quincey, in fact multiple citations to "De Quincey". The quote links to "2. To cut one's stick" as a synonym for death. Why is a smudge stick called a smudge stick? What is the origin of the phrase “to beat them off with a stick”?